Reforms are coming to the US Freedom of Information Act. The House on June 13 approved a Senate bill to amend FOIA and President Obama will sign it, the White House said. The bill writes into law a specific presumption of openness, strengthens the FOIA ombudsman, puts a time limit on the use of the deliberative process exemption and mandates more proactive openness, among other things. Getting any legislation through Congress currently is nearly impossible, so the passage of the FOIA amendments without objection ranks as an unusual occurrence. Achieving the bipartisan unanimity necessary to avoid killer roadblocks, however, came at a price. The final product was somewhat weakened over the course of the four-year campaign for its passage and doesn’t include even some relatively innocuous provisions from the House bill, such as requiring every agency to accept FOIA requests by email. Congressional sources said it is too soon to discuss strategy, which could include attaching the orphan provisions to other legislation. codify the “presumption of openness” so as to require that records be released unless the agency “reasonably foresees that disclosure would harm an interest protected by an exemption” or if disclosure is disclosure is prohibited by law. This language mirrors the Obama administration’s and the Department of Justice’s(nonbinding) instructions on FOIA. limit to a period of 25 years the ability of agencies to keep internal deliberations confidential under exemption (b)(5), an exemption that currently has no time limit and was recently used to successfully deny a CIA draft history of the 53-year-old Bay of Pigs invasion. prohibit agencies from assessing search or duplication fees when the agency fails to meet the notice requirements and time limits set by existing law, unless a request is considered voluminous (more than 5,000 pages). require agencies to update their FOIA regulations within 180 days after the passage of the bill. strengthen the Office of Government Information Services (OGIS), the FOIA ombudsman, by giving OGIS the authority to report directly to Congress and provide legislative recommendations without approval from other executive branch agencies. require agencies to publish material that has or might “become the subject of subsequent requests for substantially the same records” or if the information has been requested three or more times. require agencies to make FOIA guidance and FOIA reports available for public inspection in an electronic format. establish a Chief FOIA Officers Council charged with developing initiatives to increase transparency and compliance with FOIA and more fully define the role of Chief FOIA officers. The bill mandates “the operation of a consolidated online request portal that allows a member of the public to submit a request for records under to any agency … from a single website” and gives the implementation responsibility for this to the Office of Management and Budget. The provision does not appear to mandate a unified request system and opinions about its meaning vary. A website run by the Justice Department portal already lists the FOI websites of federal agencies,FOIA.gov. Efforts to plan a new such site, openFOIA, have not materialized. FOIAOnline is a government-created site with 12 voluntarily participating departments. The operating software for FOIA processing is provided both by the private sector and by government-developed systems. Commercial providers lobbied against a combined national site based on FOIAOnline. The Senate bill (S. 337, committee report) approved by the House is weaker in some respects that the bill passed by the House (H.R. 653). Senate strategists were aiming to achieve 100 percent support for their bill in a body where even one objecting senator can easily block action. Senate sponsors fearing that pushing the House bill, or even adding provisions from it, would create problems. One key argument was to remind senators that they had all voted for the Senate bill. Critics had called the language vague. They also said that a FOIA exemption now exists for properly classified material and that are a number of other federal laws prevent disclosure of intelligence sources and methods. For the most part, however, the House bill included provisions that pro-transparency advocates would have liked to see passed. One key difference was in the House language defining the presumption of disclosure. The House added a different twist by also requiring that information could be withheld only if an agency foresaw that disclosure would “cause specific identifiable harm to an interest protected” by an exemption. During the course of Senate development of the bill, the scope of the 25-year sunset provision concerning material exempted through the use of the deliberative process exemption b(5) was diminished. The 25-year sunset applies to the “deliberative process” privilege of Exemption Five (which covers drafts, and communications including emails and memos), but not to the attorney-client privilege and attorney work product privileges. required the court to assess “reasonable attorney fees and other litigation costs” against the U.S. government in cases when a complainant prevails in a FOIA lawsuit. Authorized applicable federal inspectors general to review agency compliance with FOIA, make recommendations to their respective agency heads, and recommend adverse action to the agency head if needed. required agencies to assign a tracking number to all requests and establish an automated system that would allow requestors to check the status of their request. Under current law, tracking numbers are only assigned to requests that will take longer than 10 days to process. required agencies to provide a name, phone number, and email address of an agency employee who can provide information on the status of each request received by the agency. required the agency to notify a requester in cases when the agency consults with another agency or outside entity that has a substantial interest in the requested record and to describe the consultation process. prevented the withholding of opinions that are controlling interpretations of law, final reports or memoranda created by an entity other than the agency that the agency used to make a final policy decision, guidance documents used by the agency to respond to the public. clarified that the name and position of any employee “responsible for the denial or partial denial” or responsive records should be included in the requester’s notification of denial. clarifed Exemption 6 which allows agencies to withhold records that would “constitute a clearly unwarranted invasion of privacy” if released. The provision would clarify that “personal information such as contact information or financial information” can be appropriately withheld. stated that releasing the name of a federal employee engaged in an official duty would not constitute an invasion of personal privacy. required an agency that denies a records request to provide the requester a list of the records that were withheld, unless provision of such a list is prohibited by law. required agencies to report and justify to the Department of Justice each case in which they determine that “disclosure of the existence of the records could reasonably be expected to interfere” with law enforcement proceedings or could identify a confidential informant. required the Government Accountability Office (GAO) to conduct audits of individual agencies’ FOIA practices, catalog the use of Exemption 3, and review and prepare a report on FOIA requests by agencies pertaining to entities that received assistance under Title 1 of the Emergency Economic Stabilization Act of 2008.
required GAO to study at least five agencies “to assess the feasibility of implementing a policy requiring noncustodians to search for records” responsive to a FOIA request. require agencies to ensure all employees receiveannual training on their FOIA-related responsibilities. required agencies to report any violation of FOIA laws or regulations to the affiliated agency inspector general. Made employees found to have intentionally violated a FOIA law or regulation would subject to the suspension and removal provisions of Title 5. The last amendments to the FOIA came in 2007. A history of the law, along with examples of 50 recent FOIA success stories, has been posted by the National Security Archive, the sponsor of FreedomInfo.org. 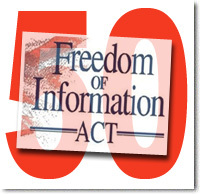 The FOIA reforms were advocated by groups including the broad Fix FOIA by 50 coalition, whose name references initial passage of the FOIA on July 4, 1966. Others celebrating the passage also urged further changes, including Daniel Schuman, policy director of DemandProgress, and Aaron Mackey of the Electronic Frontier Foundation. After this legislation becomes law, it is my hope that the House Oversight and Government Reform Committee and Senate Judiciary Committee continue to work together to push additional reform to FOIA and federal transparency. In particular, the administration’s abusive claims around privileged information begs for resolution in a more equitable way. In addition, with the Justice Department’s key role in undermining the FOIA bill and promulgating regressive FOIA regulations, it is a worthy target of granular congressional oversight. But for now, it is important to celebrate a hard-fought victory. Although the bill is a positive step forward, it falls short of fixing some of FOIA’s biggest problems, including agency delay and stonewalling. EFF has previously called on Congress to provide more resources – both technical and financial – to speed up agency processing of FOIA requests. We think those incentives should be combined with penalties for agencies that do not meet deadlines or for personnel who actively thwart disclosure. We’ve argued for big changes to the law that would mandate disclosure of records in close cases – the public interest in disclosure should outweigh secrecy. We’ve also argued for small changes, including adding a comma to make controversial law enforcement techniques more public and a requirement that all agencies accept FOIA requests via email.